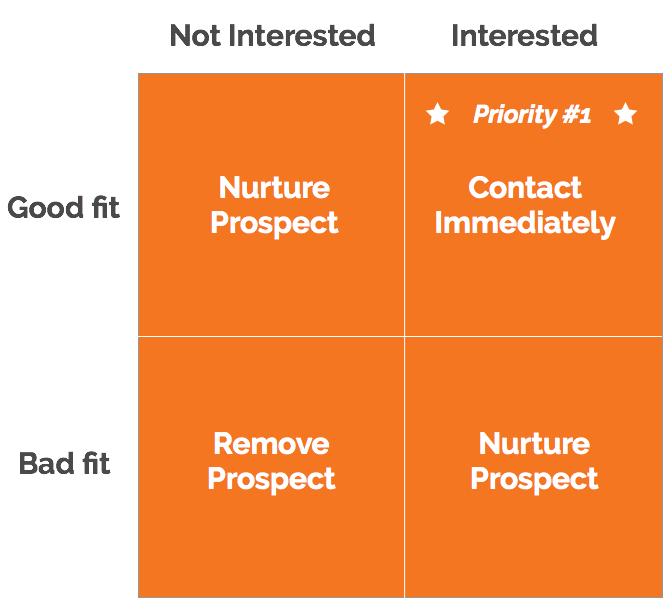 Below is the "Inbound Prospecting Matrix" -- the framework a company used to close a $50,000 deal. I'll explain details in a second. But first, there is a fundamental flaw to understand with traditional prospecting. Traditional prospecting gives you answers to only one question: Are they a good fit for our product or service? 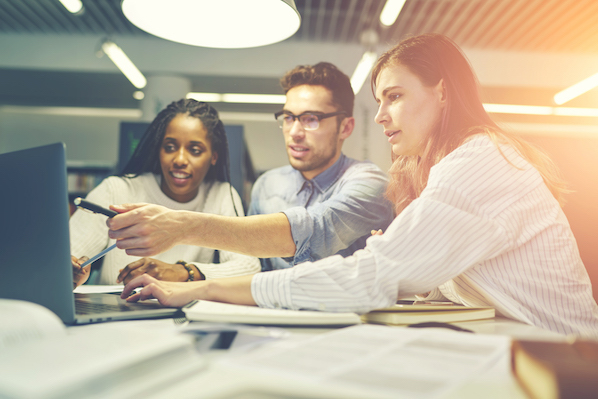 Traditional prospecting gives you an idea if a prospect is a good fit for your company in terms of company size, annual revenue, purchasing authority, industry, etc. But it ignores the question if they're currently interested in your company or not. Someone who viewed 24 pages on your website is more open to hearing from you than someone who's never heard of your business. That's why it's crucial to consider interest alongside fit when prospecting. 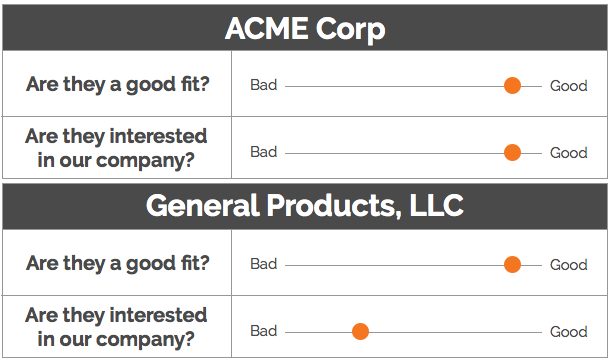 For example, take these two prospective companies (let’s call them ACME Corp vs. General Products, LLC). Which would you prioritize? The answer is obvious: ACME Corp. 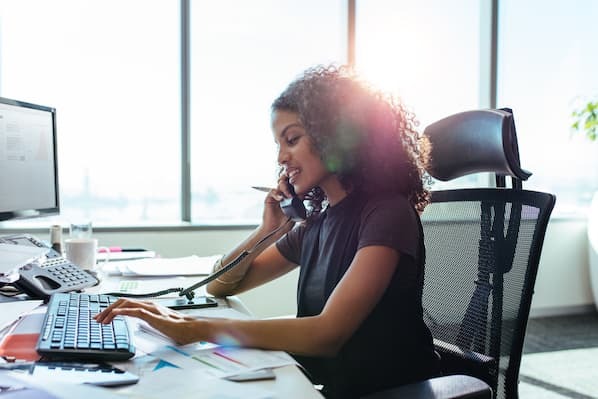 However, unless you had inbound prospecting tools, it would be impossible to know whether or not someone is interested in your company before contacting them. And without understanding someone's interest in your company, you'll waste time barking up the wrong tree time and again. If a prospect is (1) a good fit and (2) interested in your company, they are priority #1. Other prospects should either be nurtured or removed from your pipeline, dependent on their location on the matrix. 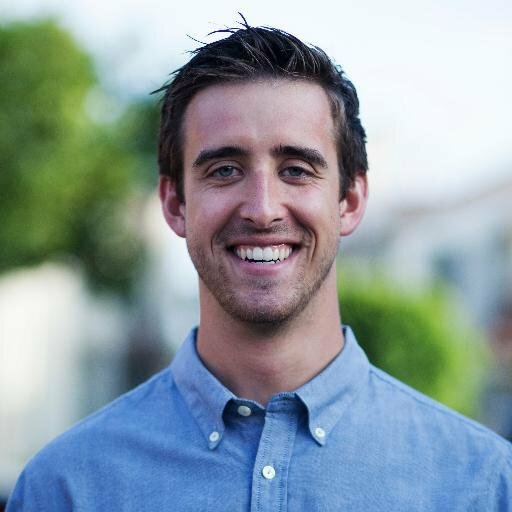 This is exactly how a web design and development company closed a $50,000 deal. Here's how to get started with the Inbound Prospecting Matrix. Step 1: Find companies that are visiting your website. Want to find companies that are interested in your company? However, in order to see this tab, you'll need to speak with your Sidekick for Business sales rep. 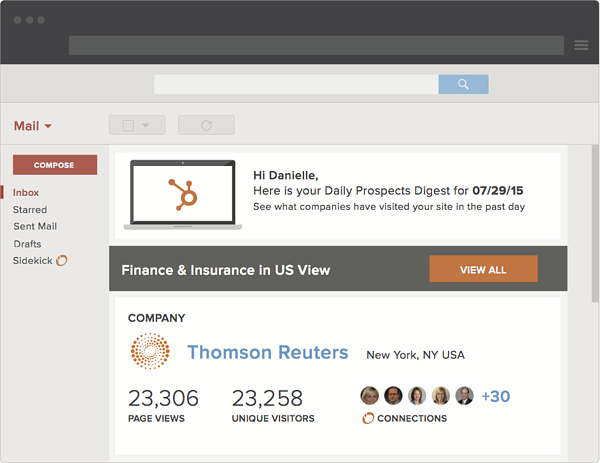 Your rep will walk you through how to set up the "Prospecting" feature on your website. Step 2: Filter companies that are a good fit. To execute this, click Add filter on the left-hand side of the screen and apply whatever filters are important for your business. A good fit in terms of industry, size, location, etc. These are your hottest prospects most likely to close. As the Inbound Prospecting Matrix dictates, you should contact them immediately. Step 3: Be notified when these prospects visit your website. If they're visiting a page listing case studies or pricing, chances are they're interested in purchasing your products or services sooner rather than later. This notification provides insight on when it's best to reach out. Understanding when companies are interested in you -- not when you're interested in them -- helps structure the conversation in a way that is maximally helpful to the buyer. 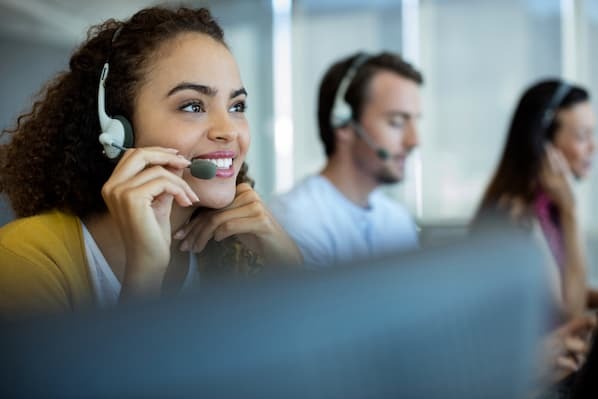 Inbound Sales isn’t about making 80 cold calls, and then celebrating three answers. It’s about delivering customized, relevant messages to prospects who are already interested in your business. Stop disrupting, and start helping. Who knows, maybe you’ll earn $50,000 in six months, too.